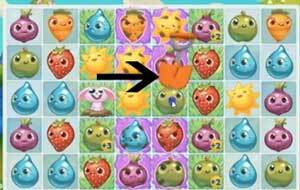 These Farm Heroes level 203 cheats and tips will help you beat level 203 of Farm Heroes. 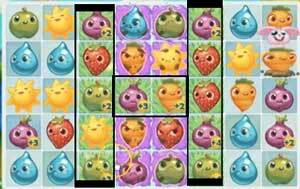 The objective of Farm Heroes level 203 is to achieve 100% growth and collect 30 apples, 30 onions, and 10 carrots. Level 203 Cheat #1: Beware the slime! 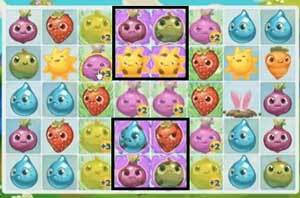 You need to look out for the globs of slime in the middle of the board. The slime will turn any cropsie into a very grouchy one. If that happens, any matches that include a grumpy will result in a big fat zero. So try and stay away from them and not accidentally match them. Because of the slime you are gong to have a great deal of grumpies. However, there is a large patch of grass in the middle of the board that can turn any grumpy into a normal cropsie that will give you points toward your objective. Shift the grumpies over to the grass so you may use them for matches and they aren’t worthless. You should also keep most of your other matches on the grass because you will receive the bonus points and will save moves when trying to fill your objectives. Since there is a tremendous amount of grumpies in this Farm Heroes Saga level, you may want to think about using the shovel. The shovel can be used to remove certain items that are in your way. Use is to remove any grumpy that is in your way of making a big match. You only have 20 moves, so you want to use them as best as possible. Using the shovel will help save your moves since using this booster does not use up any moves.